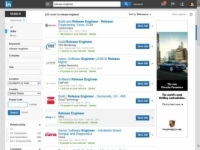 The most obvious way to look for a job is to look through LinkedIn’s advertised job openings. 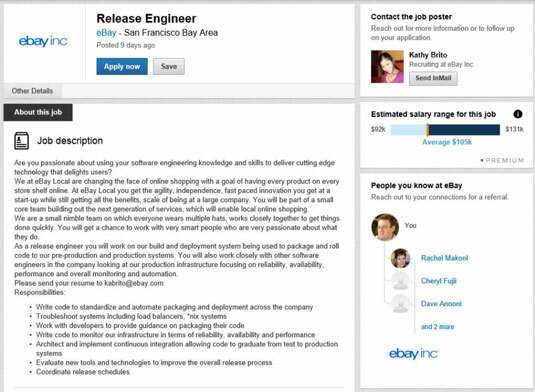 After all, someone is getting hired when a company runs a job listing, so why can’t that candidate be you? When you search for a job on LinkedIn, you can see what skills seem attractive to companies, which you can keep in mind as you refine your job search and LinkedIn profile. 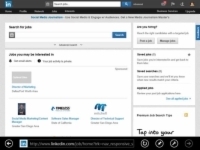 1Click the Jobs link from the top navigation bar. 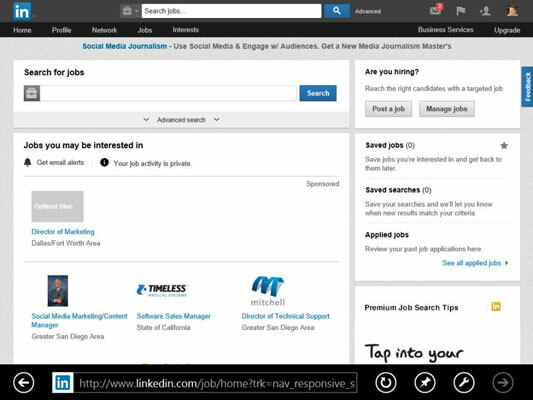 The Jobs home page appears. 2Enter keywords describing the job you want in the Search for Jobs text box. 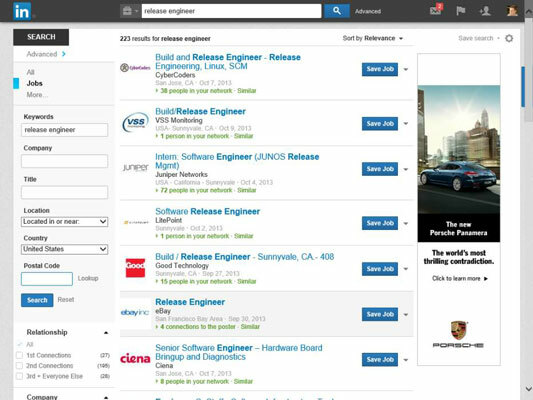 To be more precise in your search, you can click the Advanced Search link below the Search for Jobs text box to bring up some Advanced Search additional criteria, such as Industry, Function, or Salary level. You can click the More Options link (next to the Search button) to see even more search options. 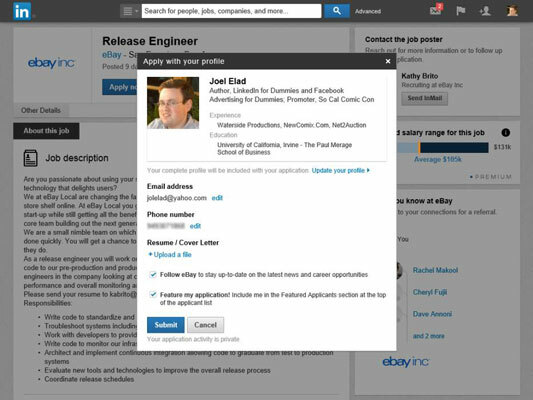 You’re taken to a LinkedIn Jobs results screen where you see the basic components of the job listings, such as Company, Title, and Location. To refine your job results, enter additional keywords or scroll down the left-hand side of the screen to use additional filters like the name of the company, how long the job posting has been online, and the location of the job. 4Click an individual job title to see the details of that job posting. You see the detailed write-up on the next screen where you can find out more about the job and the job poster. 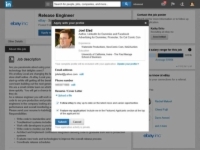 If the person who posted the job is in your network and has opted to show her name, you will see who in your LinkedIn network can refer you to that person. 5When you see a job you want to apply for, click the Apply Now button. 6Verify your contact information, then upload a cover letter (which you'll write from your word processing program) in the Resume/Cover Letter section. Include a brief summary of why you feel you’re qualified for the job in your cover letter. If you like, you can update and reuse an older cover letter you’ve used to apply to a similar job: Simply find the letter, copy the contents into your new letter, update it with the specific details of this job, and save it as a unique file, which you can upload to LinkedIn. The cover letter is a great chance for you to expand upon your experience and education to clarify to the employer why you are perfect for the job. If the job poster is in your extended network, it’s a good idea to read her profile first, see what common interests you have, and incorporate that information into your cover letter. If you have the time, approach that person first with an introduction or InMail to get more information about the job posting before you apply. Congratulations, you’ve applied for a job! Repeat Steps 2–7 to keep looking and applying for jobs.